Sega Flash Vol. 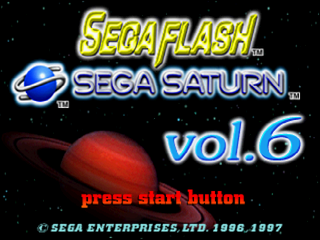 6 is the sixth demo disc in the Sega Flash series. It was released in 1997. Vol. 6 contains three playable demos; Steep Slope Sliders contains two characters and two tracks, Sega Worldwide Soccer '98: Club Edition, much like the Sega Worldwide Soccer '97 demo in previous Sega Flash discs, allows users to play half an exhibition match with any team of their choosing, and Sega Touring Car Championship contains the first track. In the United Kingdom this was released with issue #27 of Sega Saturn Magazine.